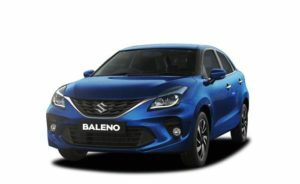 The Maruti Suzuki Baleno Facelift images reveal that the hatchback has taken the unique and extravagant appeal of its prior models to the next level. The Maruti Suzuki Baleno Facelift exterior comes with a sporty and elegant front fascia coupled with a wider stance. The 3D dynamic new grille with micro detailing aggravates the general boldness of this beauty. The striking change in the Baleno Facelift 2019 is for sure the latest precisely cut and smoked dual-tone 16” alloy wheels that marvellously complements its embracing character overall. While stepping inside you will feel you are sitting in a Maruti car, albeit in a modern lavish cabin. The interiors are dressed in an all-black colour scheme with dull-silver accents elating the spirit of the cabin. The driver interface is top notch with the instrument cluster incorporating backlit blue speedo console with multi-information display which not only showcases real-time fuel consumption and driving time but also the power and torque figures. Baleno is fully equipped with modern tech and features a 7-inch SmartPlay touchscreen infotainment powered by Android Auto and Apple CarPlay along with navigation, USB, and Bluetooth connectivity. Other comfy features include auto headlamps, rain sensing wipers, 60:40 rear seat split, push-button start, and automatic climate control. As expected in under 4-meter segment like this, the cabin is roomy with a great deal of space at the rear too. The enormous boot of 339-litre is just below Honda Jazz and can gulp large suitcases with ease. The Maruti Suzuki Baleno is powered by two engine options – a 1,197 cc petrol and a 1,248 cc diesel. The petrol engine generates 83 hp power at 6,000 rpm and 115 Nm torque at 4,000 rpm whereas, the diesel produces 74hp at 4,000 rpm and 190 Nm at 2,000 rpm. While the petrol engine is a smooth unit, the diesel is more fun to drive but can be loud as well.The Maruti Suzuki Baleno petrol has two gearbox options, a 5-speed manual and a CVT automatic. The diesel, although, comes only with a 5-speed manual transmission. Gear changes on all the transmissions are seamless shifts and sorted gear-ratios ensure good drivability throughout the rev band, except lower engine speeds. Maruti Suzuki Baleno 2019 has the potential to be the best in the premium hatchback segment. Moreover, the HEARTECT platform ensures superior performance while the McPherson strut suspension and ground clearance of 170 mm ensure smooth handling of this beauty on the roads.The dynamic prowess of the car comes from the finely tuned suspension. The ride quality is quite permeable and the suspension set-up bumps off the bad roads, producing no annoying sounds. At low speeds, one will find that the cabin is quite comfortable with no jiggles. For the first time, Maruti Suzuki Baleno Facelift features the revolutionary “HEARTECT” platform and assures extra safety for its passengers. The high tensile steel present in Baleno helps in improving the overall safety by making the body much stronger and rigid. The front disc brakes and the rear drum brakes provide stopping power to its axles. The safety features of the new Maruti Suzuki Baleno include ABS with EBD, dual airbags, pre-tensioner, ISOFIX child restraint system, speed alert system, brake assist and force limiter seatbelts with reminder, and rear parking sensors come standard across all variants. The new Baleno 2019 complies with side crash, offset and pedestrian safety norms and regulations. The new Maruti Suzuki Baleno with lucrative safety features, better exterior design and an upgraded CVT transmission is definitely worth every penny. Thereby, it gives a very tough competition to its rivals in the same segment.Maruti Baleno is offered in four different variants- Sigma, Delta, Zeta, and Alpha. Looking at the pricing, its base model Sigma is tagged at Rs. 5.36 lakh for the petrol while its diesel base variant is available at the price tag of Rs. 6.51 lakh. Baleno’s Top-spec model Alpha is tagged at Rs. 8.41 lakh for petrol while the diesel is priced at Rs. 8.5 lakh. Its top-selling model Delta 1.3 is tagged at Rs. 7.17 lakh, all priced ex-showroom, New Delhi. ← What Disabilities Are Covered By Special Education?